Alfalfa is a thirsty crop. It uses more than 20 percent of all of the irrigation water in California. The primary way of watering alfalfa is by flood irrigation. This normally results in heavy runoff, which wastes water and sends nutrients from the field into the water supply. To overcome this problem, a group of researchers from MBK Engineering, Indian Institute of Technology, and UC Davis recently sought to develop a more efficient way to flood irrigate. Alfalfa fields are divided into long bays called “checks” that are divided by low berms. Each check is flooded from the highest end, and the water flows in a sheet to the lower end. It is difficult to estimate when to shut off the water at the right time to prevent runoff. The checks tested in this project are about 220 m (720 ft) long and 15 m (50 ft) wide. During the course of the project, the current practice for determining when to cut off the water supply was compared to a more automated method using data loggers and sensors. The conventional method for determining water shutoff time requires the irrigation personnel to make several trips to the field. When testing the outcome of this practice, 6,000 to 10,000 l (1,600 to 2,600 gal) was wasted from each check every time. For the new, more automated method, the research team designed a system in which three water sensors were buried, spaced in a row (following the direction of the water flow) toward the lower end of the check. As the water sheet proceeded down the field, a Campbell Scientific CR3000 Micrologger® recorded the arrival of water at each sensor, and used a cell modem to transmit that information to the irrigators. The irrigation personnel then calculated the speed of the water’s progress over the check, and used a water-advance model to calculate when to cut off the water supply and avoid runoff. In all of the irrigation exercises in this project where the new method was used, there was no runoff. 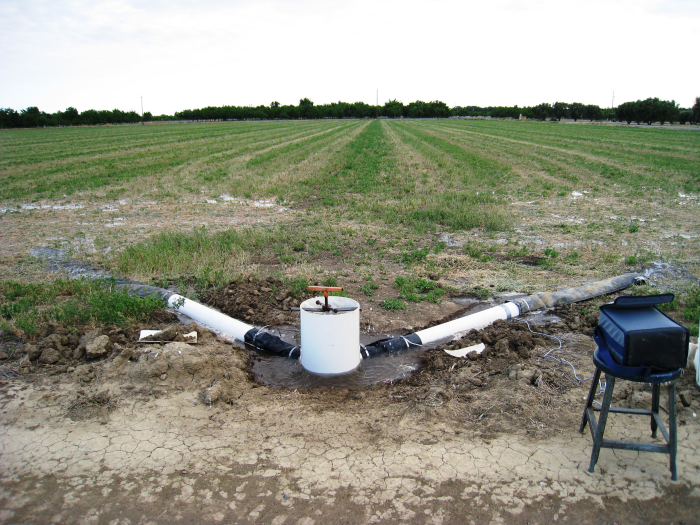 The experiment demonstrated the effectiveness of a system to measure and control flood irrigation for optimal efficiency. Since the field test, researchers have been working on a wireless system that can be left in the field for several years, monitoring up to 99 sensors within a 2 mi radius.